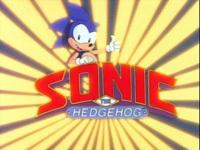 "Sonic the Hedgehog," also known as the SatAM (Saturday morning) series, was the second television program to star the famous video game icon. 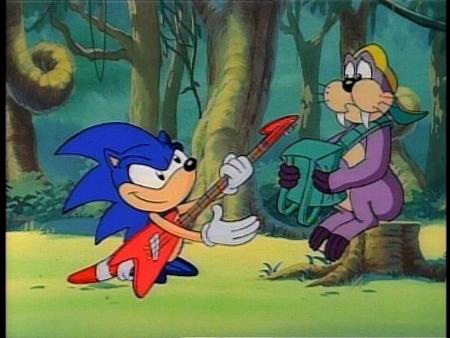 It followed the slapstick "Adventures of Sonic the Hedgehog," which was known mostly for its lighthearted approach. The SatAM, however, took on a much darker tone, telling the story of Sonic and his brave band of Freedom Fighters as they struggled to free their home world, the distant planet of Mobius from the clutches of the evil Dr. Robotnik. 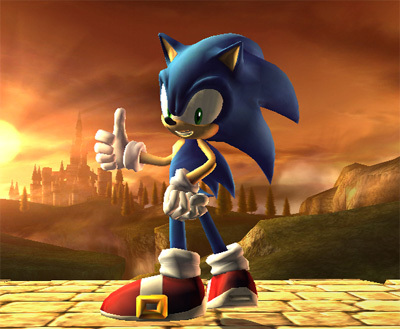 Sonic the Hedgehog - An egotistic blue blur of the title with an unsatiable appetite for adventure and chili dogs. Princess Sally Acorn - Daughter of King Acorn, rightful ruler of Mobius; leader of the Knothole Freedom Fighters and Sonic's best friend. Bunnie Rabbot - Cyborg rabbit who was in the process of being roboticized before being rescued by the Freedom Fighters. Antoine D'Coolette - Cowardly royal guard who desperately seeks the affections of Princess Sally. Dotor - The Freedom Fighters' mechanic. Miles "Tails" Prower - Sonic's other best friend...like a little brother; he looks up to Sonic and hopes to make his own contribution to the Freedom Fighters. Dulcy - Powerful but clumsy dragon; joined the Freedom Fighters. Uncle Chuck - Sonic's roboticized Uncle. Dr. Robotnik - Ruler of Mobius; achieved this by overthrowing King Acorn; cyborg villain. Snivley- Robotnik's nephew and lackey.